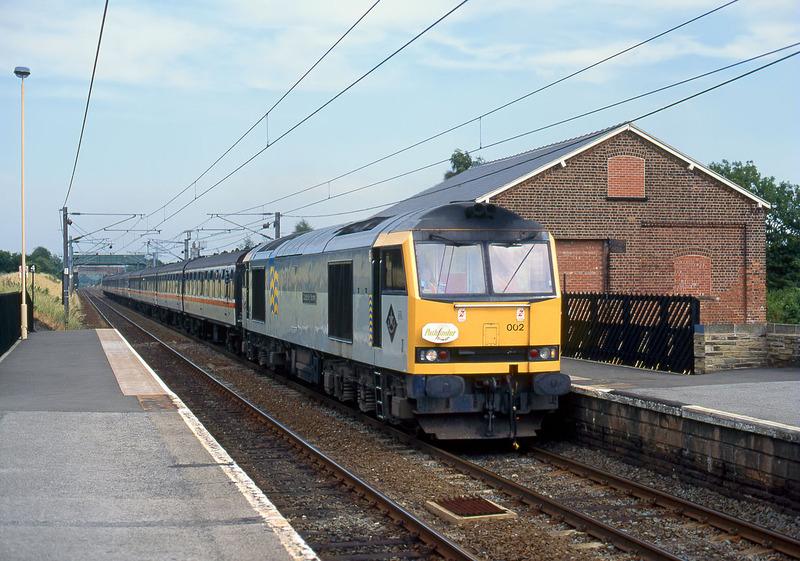 60002 Capability Brown passes through South Elmsall station with the Pathfinder Tours 'Donny Deviator' railtour on 10 July 1994, at this point running as the 1F52 16:05 Doncaster to Doncaster (via Milford). The tour had started from Derby at 09:05 as the 1Z42 to Doncaster with 58034, this was followed by 37694 & 37698 working top'n'tail with 56077 on the 1F50 11:42 Doncaster to Doncaster (via Silverwood). The next trip was the 1F51 13:48 via Drax. After all this excitement the tour headed back to Derby behind 31271 & 31276 as the 1Z42 1800 ex Doncaster!